The "XMLmind XSL Customizer" application is a companion application embedded in XMLmind XML Editor and XMLmind XSL Utility. This application is invoked by clicking the Edit XSLT stylesheet button found in XMLmind XML Editor and XMLmind XSL Utility. It allows to modify a custom XSLT stylesheet created by clicking the Customize XSLT stylesheet button found in XMLmind XML Editor and XMLmind XSL Utility. and this, without prior knowledge of XSLT. What are attribute sets and parameters? The name of the parameter is "paper.type". The value of the parameter is literal string "USletter". The name of the attribute set is "monospace.verbatim.properties". This attribute set includes two other attribute sets: verbatim.properties and monospace.properties. This attribute set directly contains attribute text-align="start". 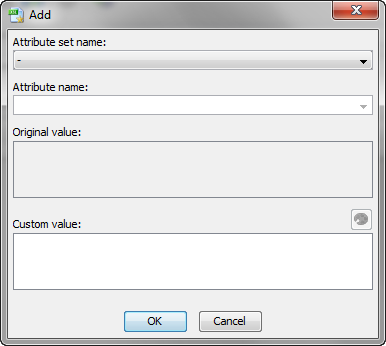 This attribute set directly contains attribute wrap-option="no-wrap". An attribute set can contain any attribute. However attribute sets are mainly used in XSLT stylesheets which generate XSL-FO. The XSL-FO intermediate file generated by the XSLT stylesheet is then processed by programs such as Apache FOP, RenderX XEP, Antenna House XSL Formatter, XMLmind XSL-FO Converter, etc, in order to create the deliverable: PDF, PostScript, RTF, .docx, .odt, etc. The attribute sets are used in this case because they are the only way to influence the look of the deliverable. Such attribute sets contain standard XSL-FO presentation attributes (very similar to the CSS properties): color, font-family, line-height, margin-left, etc. Create a customization of an existing XSLT stylesheet. This button displays the standard file chooser dialog box allowing to choose the XSLT stylesheet for which a customization is to be created. Open a custom XSLT stylesheet previously created by clicking the New button. This button displays the standard file chooser dialog box allowing to choose the custom XSLT stylesheet to be opened. Close currently opened XSLT stylesheet. Save the changes made to currently opened XSLT stylesheet. Save currently opened XSLT stylesheet to a different file. 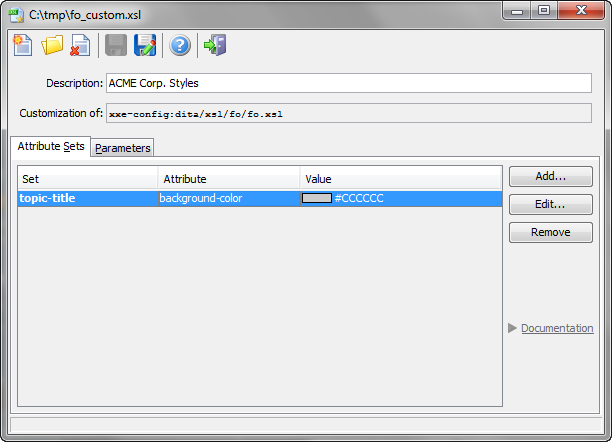 Close "XMLmind XSL Customizer" main window. Because "XMLmind XSL Customizer" is an (embedded) application and not a modal dialog box, you can keep it open while converting an XML document in XMLmind XML Editor or in XMLmind XSL Utility. This allows to experiment with attribute sets and parameters until you are satisfied with the result of the conversion. Short description of the currently opened custom XSLT stylesheet. XMLmind XML Editor requires a custom XSLT stylesheet to have such description. Read-only text field: URI of the stock XSLT stylesheet for which the currently opened XSLT stylesheet is a customization. Add an attribute to one of the attribute sets supported by currently opened XSLT stylesheet. This button displays the Add/Edit attribute dialog box. How to use this dialog box is described in the example below. However, if the user happens to know what she/he is doing and nevertheless enters one or more XML nodes in the Custom value field, then XMLmind XSL Customizer will ask her/him to confirm that this is really what she/he wants and make it work. This button displays the Add/Edit attribute dialog box. Start the web browser and make it display the page containing the documentation about currently selected attribute. This button is disabled (grayed) when such documentation is not available. For now, only the DocBook XSL Stylesheets provide some documentation for their attribute sets. Set one of the parameters supported by currently opened XSLT stylesheet. This button displays the Add/Edit parameter dialog box. How to use this dialog box is described in the example below. This button displays the Add/Edit parameter dialog box. Start the web browser and make it display the page containing the documentation about currently selected parameter. This button is disabled (grayed) when such documentation is not available. 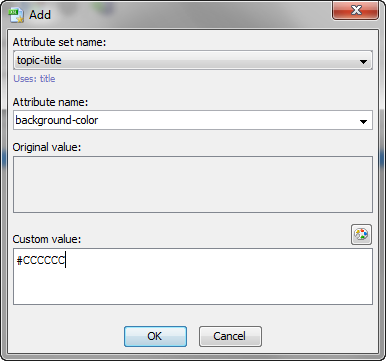 This is specified by adding attribute background-color=#CCCCCC to the attribute-set called topic-title. Select the Attribute Sets tab. Click Add. 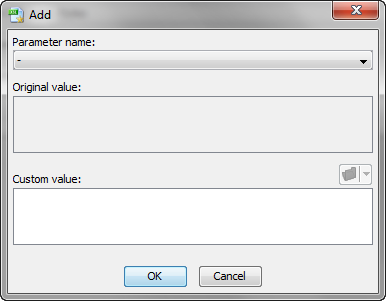 This displays the Add/Edit attribute dialog box. In the "Attribute set name:" combobox, select topic-title. In the "Attribute:" combobox, type "background-color" or select this commonly used attribute from the drop down list. The "Original value:" read-only text field remains empty, indicating that the stock XSLT stylesheet does not specify attribute topic-title/background-color. In the "Custom value:" field, type "#CCCCCC". 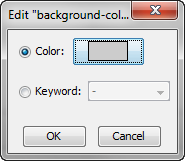 Or more simply, click "Edit style attribute" and use the background-color editor to specify a light gray color. This is specified by setting parameter base-font-size to 12pt. Click Add. 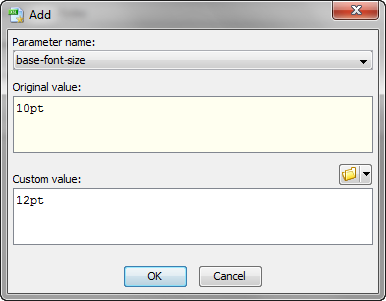 This displays the Add/Edit parameter dialog box. In the "Parameter name:" combobox, select base-font-size. The "Original value:" read-only text field changes to "10pt", which is the value of parameter base-font-size specified in the stock XSLT stylesheet. In the "Custom value:" field, type "12pt".